In the judgment today in L’Oréal Société Anonyme RN Ventures Ltd  EWHC 173 (Pat) Mr Justice Henry Carr set out his concerns on aspects of the procedure and expert evidence before the court. The judgment contains some lessons for litigators and expert witnesses. It also gives an important lesson to advocates who attempt to “jump the gun” in relation to the assessment of expert evidence. 7. This case was heard under the Shorter Trial pilot scheme. Although L’Oréal relied upon experiments in support of its case of infringement of the Patent, which were the subject of significant cross-examination, the timetable was adhered to and the issues were fully debated. It was a positive advantage that Counsel were only required to put the principal issues in cross-examination. 8. Unfortunately, a good part of the first morning of the trial was spent in resolving procedural disputes between the parties. One dispute arose from RN Ventures’ skeleton argument and could not have been raised before. Other disputes concerned the admissibility of evidence. This used up some of the time available to discuss the substantive issues. In the context of a Shorter Trial, all effort should be made to resolve such disputes. Otherwise, then if at all possible they should be decided before the trial starts. 9. The scope for admissible expert evidence in this case is narrow. The parties each relied upon expert evidence in relation to infringement of the Patent and validity squeezes, and in relation to the design corpus and design freedom. The expert witnesses for L’Oréal were Professor Stephen Franklin and Mr Philip Phelan. RN Ventures relied on the evidence of a single expert, Mr Kevin Herbert. 10. Professor Franklin is a Royal Academy of Engineering Visiting Professor at the University of Sheffield. He specialises in tribology and, since about 2000, primarily in tribology of the human body. Tribology is the science of friction, lubrication and wear. The design of skin-contacting devices requires consideration and measurement of friction, or the forces, deformation and stresses involved in the relative slipping motion of such devices over the skin. Professor Franklin’s research interests include the tribology of human tissue, including the skin and eyes, which is known as “bio-tribology”. 11. Professor Franklin is employed by Philips Research, a division of Koninklijke Philips NV. He leads research on the interaction of products with the human body, including products that interact with the skin, for example shaving products. In 2016 and early 2017 he was involved, as a skin and bio-tribology specialist, in specifying and developing experimental protocols for testing the efficacy of Philips’ VisaPure product, which is a mechanical facial cleansing brush. 12. Professor Franklin was criticised in trenchant terms in RN Ventures’ opening skeleton, where he was described as a “hired gun”. Generally, it is advisable to comment on expert witnesses after they have been cross-examined. After he had given evidence, Mr Davis accepted, sensibly, that Professor Franklin gave frank evidence which was of assistance to the court. Nonetheless, he claimed that Professor Franklin’s written evidence was careless, that much of his reports were written for him and were not checked by him. I do not accept this. Professor Franklin asked for certain figures in his report to be prepared for him, which he was entitled to do. Insofar as Professor Franklin corrected material parts of his expert reports, I shall consider their significance in relation to the substantive issues. 14. Mr Phelan is a design consultant. He provides consultancy services through Phelan Associates, which he founded in 2001. He has been involved with the industrial design of consumer electronics since 1991 and has worked on a range of domestic appliances, handheld consumer electronics and personal care products. Mr Phelan was criticised for failing to investigate the design corpus beyond the designs identified by Mr Herbert. 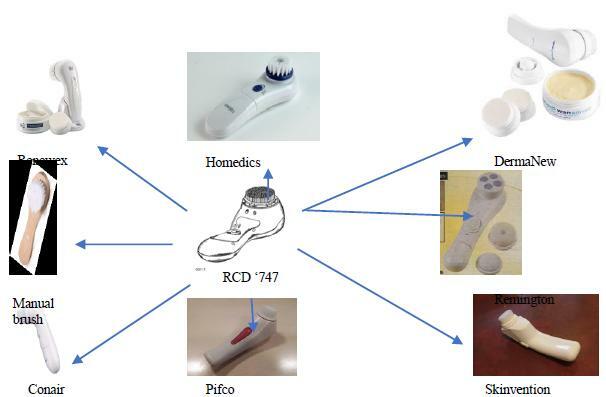 It was said that he ought to have referred to the Second Claimant’s Clarisonic range of facial care brushes when considering the design corpus for the 046 Design. Mr Phelan was only permitted to give evidence in response to Mr Herbert’s report, which also made no reference to the Clarisonic range. I do not consider that this criticism is justified. It was also suggested that he only considered absolute technical constraints on design freedom. I disagree, and I found that his evidence about design freedom was helpful. 15. Mr Herbert has a BSC in Physics and Medical Physics from the University of Wales. He completed an Open University law course in 2007 and obtained a postgraduate certificate in intellectual property from Bournemouth University in 2013. He is the managing director of Certainty IP Ltd, which he formed in 2015. His LinkedIn page explains that he opened an intellectual property consultancy to help SMEs and start-up companies avoid IP issues while identifying and protecting their existing IP in an effective and affordable way. Between 1998 and 2004 he worked as a project engineer for IXA Medical Products LLP. His CV states that he designed and developed professional and consumer medical devices for UK and global markets. Between June 2004 and December 2005, he joined the Dezak Group Limited as senior project engineer. His CV states that he designed and developed lifestyle consumer devices for UK and global markets. From December 2005, he became a legal manager for the Dezak Group Limited in relation to its intellectual property portfolio and between December 2013 and October 2015 he was EMEA intellectual property coordinator for Zimmer Biomet. 16. During cross-examination, Mr Herbert stated that he had worked on a skin brush shortly after the priority date. This was not referred to in his written evidence and no detail was provided as to what role he had taken. 17. At paragraph  of his first report he stated that “it has been emphasised to me that my evidence is to be confined to my knowledge of the technical field and should try to avoid straying into legal matters.” I accept that he tried to follow that direction. However, particularly in his supplementary report, he tended to argue RN Ventures’ case, rather than confine himself to expert opinion. 18. In his first report, Mr Herbert copied passages which he had found on the Internet, without referring to the sources from which he had taken the material. His report contains footnotes, but not in respect of the copied material. On several occasions, Mr Herbert copied material which had been published subsequent to the priority date, without acknowledging that he was using such material or identifying its date of publication. He also, on occasion, made significant alterations to passages which he had copied, without acknowledging that he had done so. For example, he copied a passage from a Dupont leaflet published in 2014 which concerned the tendency of certain nylon filaments to abrade when rubbed against sandpaper. In his report, the text was altered to a discussion about face brushes when used against skin. That was misleading, as it changed entirely the context of the source material. 19. Mr Herbert should not have done this, and was in difficulty when this was raised with him during his oral evidence. He apologised for what he had done and stated that he had not knowingly behaved unfairly. I am confident that, having been cross-examined at length on this issue, he will not do it again. The reason why he copied the sources, without acknowledging what he had done, was, as he said, to bring him “up to speed”. He did not have the expertise in the field to prepare his expert evidence from his own knowledge, using his own words. 20. It is important to keep these criticisms in perspective. Having heard his evidence I do not consider that Mr Herbert was untruthful, nor that he was deliberately trying to mislead the court. He is intelligent and enthusiastic, but he did not have anything like the practical or academic expertise of Professor Franklin, and I shall have regard to this when considering areas of dispute between them. The claimant was largely successful.